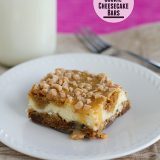 Completely decadent and rich, these Caramel Cookie Cheesecake Bars are sure to quench your cookie and cheesecake cravings. Preheat the oven to 350°F. Grease an 8×8 inch baking dish. In a medium bowl, combine the cookie mix, butter and water. Stir together until a soft dough forms. Add in 1/4 cup of the toffee pieces and stir to combine. Press about 2/3 of the cookie dough into the bottom of the baking dish. Bake for 10 minutes. Remove from the oven and allow to cool for 10 minutes. Meanwhile, beat together the cream cheese and the sugar. Add in the egg, and beat until smooth. Beat in the vanilla. Pour the cheesecake mixture over the cookie crust. Take the remaining cookie dough and break into small pieces and drop over the top of the cheesecake layer. Bake for 20 minutes, then turn off the oven and allow the bars to remain in the oven for 10 more minutes. Remove and let cool in the refrigerator for about 1 hour. Once the bars are cool, make the caramel topping. Place the caramels in a microwave safe bowl with the evaporated milk. Heat in 30 second intervals at 50%, stirring after each interval, until the caramels are melted and combined with the milk. Pour over the cooled bars. Sprinkle the remaining toffee pieces over the top. Refrigerate until the caramel starts to set up before cutting and serving.